What a night, for us sisters. 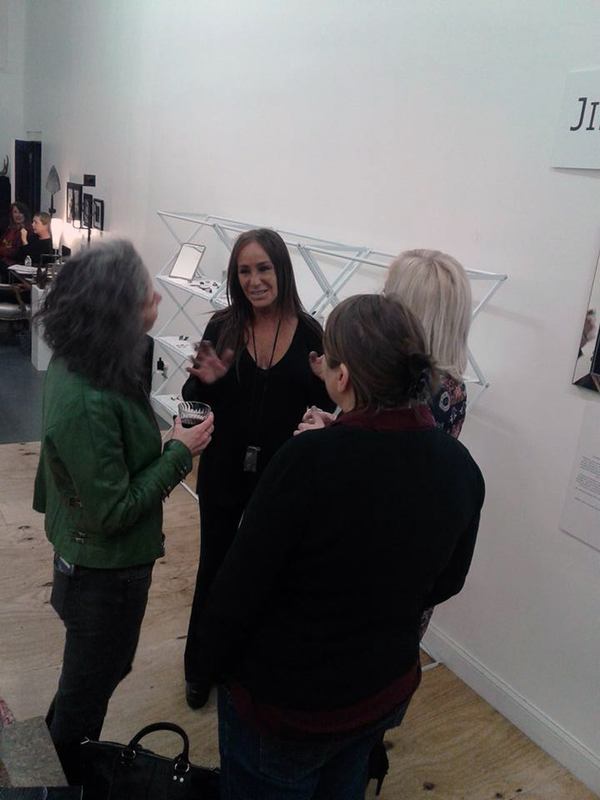 Last night, I had the pleasure of visiting Gallery OVO for a "sisters only" jewelry show. This year, this Valley Girl has been getting out. This was my first art event in South Orange, New Jersey. It was cool, though, because I got to see a lot of fabulous women I know from the Valley Arts District. This event was also celebrating Catherine Delett and everything she does for artists. The Valley is beautiful this time of year. 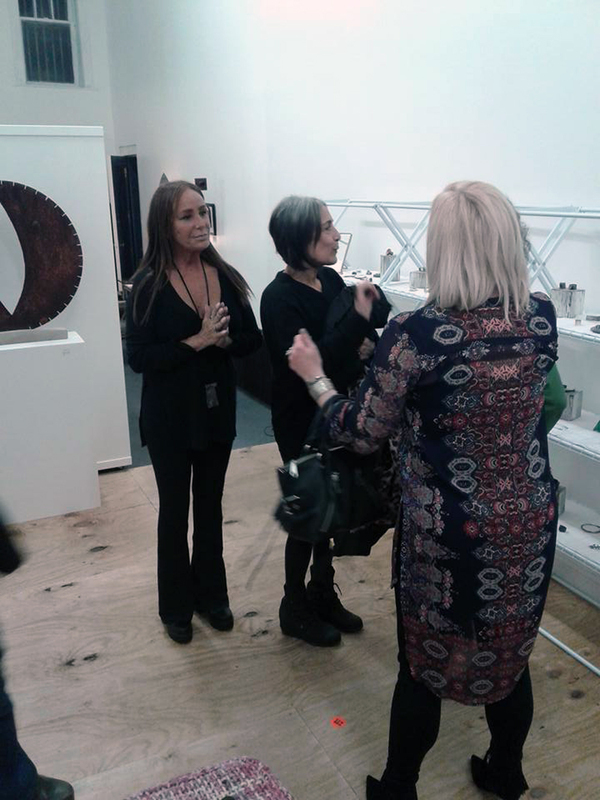 Gallery OVO owner Caro Kalb-Marr (left) and artist/jewelry-maker Jill Weissman Herlands of MetalurJ (right). 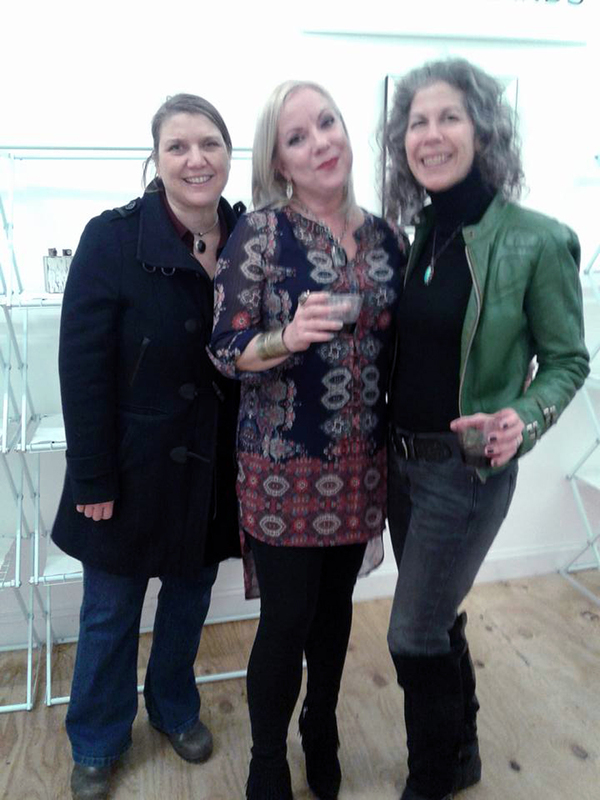 I was one of the first to arrive, which I liked because I got a chance to meet Caro Kalb-Marr (owner of Gallery OVO) and Jill Weissman Herlands (the jewelry designer). I informed them that for the night, I was the "new Greg," a.k.a Gregory Burrus, the social media expert. It was nice to hear them speak so highly of him and how good he does his job. He has a great way of connecting people. I made sure to have a camera on hand for those special candid moments. The jewelry show, "MetalurJ," was a unique one. All pieces were one of a kind and bold with a metal finish -- a series of earrings, bracelets, statement necklaces and more. I could not help but try on multiple pieces, you know, just to see how it looks on. Patrons were able to enjoy a 15% off sale on everything. Perfect for the holidays. Jill Herlands, who met Caro when they worked together in the music industry, was a fabulous treat that night as well. I was able to catch up with her, as I wanted to learn more. I have seen a lot of jewelry designers and shows, and her pieces were just spectacular pieces. Patricia Rogers: Why did you begin designing jewelry? Jill Herlands: I have been taking things apart for as long as I can remember; I.e clothing and old jewelry and reworking them to create a new and unique design. I always went with my gut and felt as if I was communicating with the jewelry. Now I literally talk to my metal and it responds by flexing and bending. I have always had an attraction to silver even before I worked with it. But now, I feel its pull and I know that I can make it bend to my whim by experimenting and taking risks. I do not believe in following the "rules" and instead use my imagination. If it works in the end, that's great and if it doesn't, I have definitely learned something new along the way. I love the hardness of metal and that I can make it malleable with heat and my bare hands. That's attractive to me; the way in which my imagination comes to life with my hands and my metal. Also there, was Chrissy McIntyre, an artist who exhibited at Hat City Kitchen a couple years ago. I would call hers "the British show." It was nice to put a face to her name. She was one of the few artists I was not able to interview for the blog. Her work was a fan favorite, as it artfully portrayed British slang. I hope to catch up with her soon as well. Julie Martini, from Valley Arts, was also there. I loved catching up with Catherine Delett who runs Arts in SOMa and the Valley, a newsletter of upcoming events. She has always been very cool. Her work was also on display at Hat City Kitchen. Birds are her specialty. I am glad she is being recognized for her work in getting the word out there! "We've been open only 3 months. We held our official opening show on October 15th! My husband is an Artist and we had sold our big house in Maplewood and moved into the new apts. @ Third and Valley. We desperately needed to find a studio for him paint in. We fell in love with this space and rented it.... renovating into a big, beautiful white box. The ceilings are 18' high and the light just floods in. We felt like we were back in downtown New York City. The fact that I could walk to the studio and train Station to The City from home, the diversity we cherish in our communities and the fact that we could remain in the area sealed the deal. Then the town told us that 'storefronts' had to be open to the public at some point in time but that we could make our own hours. This got us thinking and thus... OVO was born. I run the Gallery and Curate the collections we show, while Richard uses the backspace to create/paint space as his studio." "OVO" is Latin for egg. I chose that name as it harks back to creation... the beginning of something. We at OVO have a Hashtag and saying: #ArtIsForEveryone. Art should be accessible to everyone and that's why we're here with no plans to leave anytime soon, although we will close each summer during July and August to replenish and revive. Stay tuned for more information by liking Gallery OVO on Facebook.